Justicia adhatoda is a perennial shrub native to parts of Asia. The leaves of the plant contain vasicine, an alkaloid with medicinal qualities. This alkaloid, along with other compounds found in the plant, makes it useful in treating a variety of medical conditions. In areas where the plant grows wild, local populations commonly use the shrub to treat coughs, colds, and asthma. The leaves also treat skin infections, fever, and inflammation. Although Justicia adhatoda produces flowers as well as fruit, the leaves contain most of the beneficial alkaloids. The leaves have a bitter taste and are rarely eaten whole. One method of preparation involves steeping the leaves in hot water, effectively leaching the active ingredients and making a medicinal tea. The addition of sugar or honey to the resulting brew helps to overcome the bitterness. 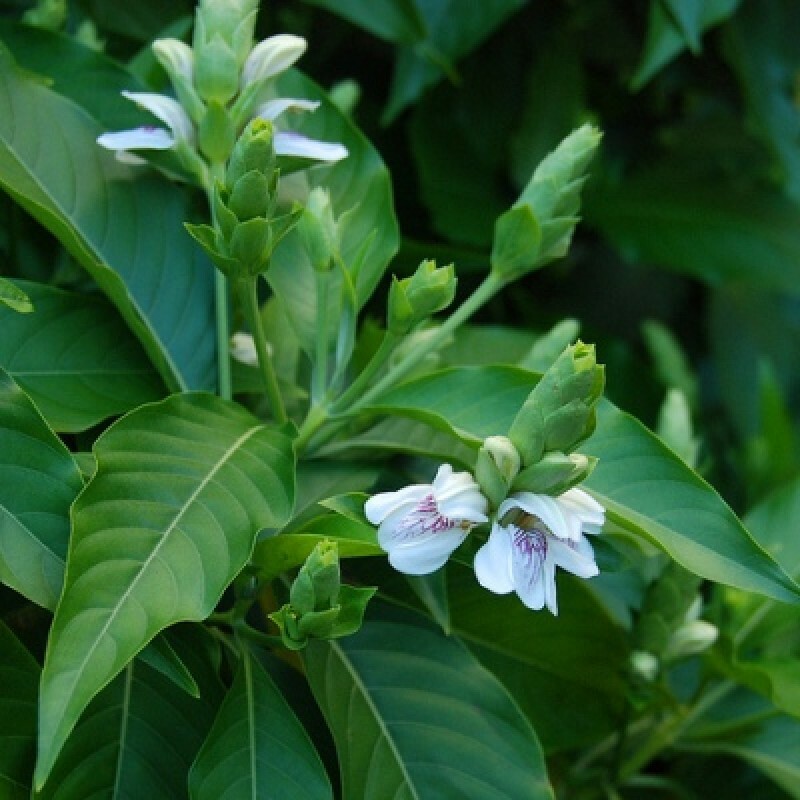 A Justicia adhatoda tea works as a bronchodilator, acting as a respiratory stimulant to help breathing issues. Another method of using the plant is to smoke the leaves. The user removes the leaves, allows them to dry, then rolls them into a cigarette shape. This method is more appropriate for adult use. The smoke contains the active compounds of Justicia adhatoda and is an effective means for carrying the compounds into the bronchial airways and lungs. The plant also works as a mucolytic agent, softening and loosening mucus in the breathing passages and making the mucus easier to expel. Justicia adhotada works to treat fever and inflammation with its antibacterial action. The plant is not an effective treatment for all bacteria strains, but compounds in the plant’s leaves are effective against Escherichia coli, Salmonella typhi, and Klebsiella pneumoniae. The active compounds in the leaves reduce fever and inflammation as they eliminate the offending bacteria. Along with its medicinal qualities, the plant’s bitter taste repels insects. It is commercially cultivated in India, where farmers use the leaves as an herbicide.